Choose the top 3-5 performers over a 5 year period, the fund performs in the top 25% throughout that period. The fund manager – have they managed through both a growth cycle and a recession? Is their investment philosophy the same? Please do subscribe to our podcast on iTunes, and leave a rating and review. This helps the podcast to rank higher and therefore makes it more visible to others browsing podcasts in the hope they too may benefit from our content. Announcer: 00:00 Welcome to Working Women’s Wealth where we discuss what it takes to build real wealth in a way normal humans can understand. Here’s your host, Lisa Linfield. Lisa Linfield: 00:09 Hello, everybody. Thank you for joining us today for Working Women’s Wealth. 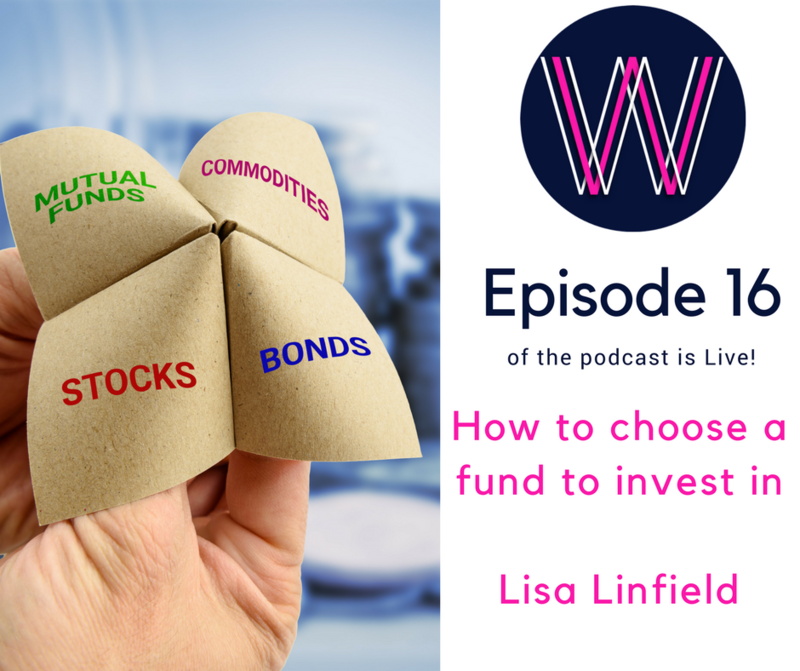 Today is another in our series on psyche, more advanced investing, and this session is supposed to answer the question, how do I choose a fund to invest in? In South Africa, we call them unit trusts, and in America, they’re called mutual funds, but regardless, basically, what a fund does is it puts together a whole bunch of investments to reach a certain objective. Usually, those objectives are very clearly stated, and you can choose which fund you’re invested in, but most people look at me and go, in South Africa, there are over 1, 000 funds and overseas worldwide, there are many times more funds to invest in. How do you choose the right fund to invest in? Well, I wanted to share with you the way I do it or the status process that I have within my wealth management business, so that you can use those same steps for your personal life. The first one and the one we always start off with is your personal risk profile. When we started our series on investing, I had mentioned to you that the most important thing that you can do is begin by understanding your personal risk profile because if you’re in a share, or in a fund, or in any form of investment that is very, very, very risky, and you’re very, very, very conservative, when that share goes up and down, specifically down, you’re going to get terrified and jump out of it. The worse thing you can do, from an investing perspective, is to get out of funds when they crash because what we call it is that you lock in the losses. You need to be able to ride out the drops in price in order to make sure that you then can regain your money, recover all of your money. The most important thing to do is to match the investment risk to your personal risk, and that is one of the number one basic fundamentals of investing, is don’t invest in something that’s very risky when you’re not a very aggressive investor. On our website, workingwomenswealth.com, you’re able to go into it, and there’s a form you can fill out to take what your investment risk profile is, and we send you a link to a questionnaire that you can fill in. By knowing if you’re a cautious investor, a moderate or balanced investor, or an aggressive investor, then helps you to judge which type of funds you should be in. People’s personal risk profile and their financial risk profile are not always the same thing. You might be absolutely happy to bungee jump off a bridge, but you might not be happy to have aggressive investments because of your personal circumstances. Either at some stage in your life, you lost money and don’t want to be there again, or your personal circumstances are that you can’t afford to lose a cent of money because there are things that you need to do. The first place we always start is at your personal risk profile. Thereafter, you can match that personal risk profile to the funds, and what usually tends to happen is that funds often have, in their name, the type of risk person that they have checked. Often you will have the cautious fund, or the aggressive fund, or the equity fund, which means that it’s aggressive, or the balanced fund, and those generally tend to help us match our type of risk profile with the risk profile of the fund. If you’re not an advanced investor, my view is that you should buy a fund that has a good mix of different asset classes where the fund manager’s managing the risk on your behalf, so that you’re not trying to buy some shares, and some money market, and some bonds, and some this, and trying to hope that you’re gonna get the right thing at the end of the day. The analogy I like to use is what you want to do is you want to go and buy a pre-prepared meal from the supermarket. You don’t want to try and buy the ingredients and do it by yourself if you’ve never cooked before. By buying a fund that has already got a mix of bonds, and cash, and property, and equities, that means that someone else is cooking up the dish, and you got to just decide which dish you want to have. What I suggest people do in terms of their investments is that they assess or choose a fund for a number of different criteria, and the first one is performance. In South Africa as well as in America as well as in anywhere, you can find what they call performance tables of all of these funds. How you [inaudible 00:05:10] to the tables is that you go in and you say I want the low equity, and a low equity’s usually a cautious fund. I want all the cautious funds, so you select out the cautious funds. In South Africa, that there’s [inaudible 00:05:24] Low Equity Index, and you can then see who performed the best, and you choose the top three performers, and then you go and look at all the other things related to it, or top five performers, or top 10 performers. In the wealth management business, we take a whole bunch of funds, and we narrow them down for certain criteria. If performance is the first criteria, how does this fund perform? The thing that you want to look for is that over a five-year period, minimum of a five-year period, the fund performs in the top quartile because we’re longterm investors. We’re not trying to be gamblers and make a quick buck. If you’ve got a one, two, three-year time horizon, you should be investing in bonds or money markets. You should be investing in things that only have cash, but if your horizon is over three years, then you can start including shares inside it. The thing that I would do is then look for five-year top quartile performance, and top quartile means that the fund is in the top 25% of all of its type of funds for a period of five years. If you look at the return over five years, they are in that top quartile, and after you select it, that fund in the top quartile, and you’ve worked out which the top three, four, five are, then you go onto each of the websites of those funds and pull down the fund fact sheet, and the fund fact sheet provides you with information on that fund. Only then when you, as you go and look inside the fund, can you start looking at the other elements. The next element I’d look at, number two, is the risk of a share, or a fund, or whatever it is that you’re investing in. Remember, that usually the higher the risk, the higher the return, but there are instances where you can put together a portfolio that has high return for lower risk, and that’s obviously what we want. If we’re gonna get the 15% return and one fund is twice as risky as another fund, well then goodness, it’s quite clear that you would take the fund that has the least risk. The more chance you have of getting that 15% return with as little risk as possible, the better it is. The things that you look for risk, there are a couple of things, and many, many measures, and when we invest and we choose funds, there are a large number of factors we look into, but there are few basic ones. The first one is what we call volatility, which is does this share go up and down and up and down, or does this fund go up and down and up and down all the time, because the problem with things that go down is that if your money drops, it has to grow a lot even just to get stable. If your fund drops from 100 to 50, you might have lost 50% of the fund, but if the fund has then gotta go from 50 back up to 100, it’s gonna have to have 100% gain in order to become square. It’s gonna have to double basically in order to be square. That’s why we look at volatility because things that go up and down all the time have more chance of losing your money in the long run than things that are stably growing because you’ve always got to make up the previous loss that’s just been made. The other factor relating to, in a pretty similar context, is what’s called drawdown, and drawdown is the size of how much money it loses when it drops. If you’re owning $100, the share is at $100 or the unit trust is at $100, and it drops down to 50, then its drawdown, it draws down 50 rent, or percent, or whatever it is that the measure is in. What you want to make sure is that there is as little drawdown as is possible, it goes negative as few times as possible. The other way that people look at that is they say how many months of positive return in the last 12 months, 24 months, 36 months, et cetera, because basically what they’re saying is if, for example, out of the last 12 months, it’s been 10 months positive, it means its lost money over two months, and then you want to go and say well, did it lose a little bit, or did it lose a lot, and how did that work in comparison to the market? The second thing that we look at is risk, and we look at volatility, how up and down does it go, or is it a nice steady unit trust, and secondly, when it does go down, how long does it stay down, and how much does it go down, specifically relative to the market but in actual terms itself. The third factor that we look at is fees. As many of you know, I’m passionate about managing our fees. I’m absolutely fine to pay fees personally and for my clients to pay fees if it’s within the context of a well-performing, high-return for lower risk fund. I’m not prepared to pay fees if their performance is not there. What we look at is fees for a like-minded bunch of unit trusts. If you have two unit trusts that have the exact same performance later, they both grew 15%, and they have the exact same drawdown. They spent, out of the last five years or 60 months, they spent 52 months positive and then how much do they cost, and if you have two equally-looking unit trusts, then I will always go for the one that has the lowest fees because fees are a longterm predictor of lack of growth, and because like you can have compound growth positive, you can have compound losses negative. If every single month a huge amount of your money’s being paid to line the pockets of investment managers, that’s not a good thing. If you’re paying a little bit more for much better performance and much better fundamentals, then that’s perfect. That’s great. I’m absolutely fine with that, but one needs to be very careful and mindful of fees and hold people accountable. For this, the easiest thing you can do is phone the call center of a unit trust or anywhere that sells unit trusts, the supermarkets that we call lisps or platforms, if you phone them up, and you say can you please tell me what the, in South Africa we call it the TIC, the Total Investment Charges, because what often happens is that funds only show their administration costs, and administration cost is always the lowest of all the fees, and the rest of the fees get taken out of the price. Instead of your share growing 100 grand, your share only grows 90 rent, or your unit trust only goes 90 rent because the rest of the things have been taken out, or it shows that it’s growing 100 grand, but instead of having 100 units, you now only have 96 units because you’re actually paying four percent in fees. It’s hugely important that you then, after you’ve looked at performance, and you’ve looked at risk, that you then look at fees. Another, and last, and very important thing is that you look at the fund manager, and what you want ideally is a fund manager with enough experience that they’ve managed through the good times, and they’ve managed through the bad times. If the fund manager of the fund you’re choosing has only got three years worth of experience, that’s not enough. They need a minimum of five years worth of experience, if not more, and preferably they needed to have managed a fund through good times and through bad times. You need to make sure that their investment philosophy and your investment philosophy are aligned. If they believe in making a quick buck, and you don’t believe in making a quick buck, don’t invest in that share or unit trust. It’s hugely important that you look at and examine the things that you invested and then that you continue to track them overtime because what I find when I get clients is that they have spent 20 years investing a lot of money into a fund that’s gone backwards or hasn’t shown much growth, and the only reason why is that they just haven’t ever looked at their investment statements. It looks like it’s growing, but in actual fact, it’s only growing because you’re contributing money and not because it’s getting market growth. Make sure you track it, and keep an eye on it, and spend at least five minutes every single week teaching yourself about money, and going and being organized about your investment statements. I hope that’s helped you to make some better choices and decisions around what you invest in, and speak to a financial advisor if you’re not sure because the amount of money that it can cost you to get your decisions wrong versus the amount of money that you’re gonna pay for some good advice, I generally found that it’s often worth getting someone who knows about this because a challenge with your money is the longer it compounds positively, the better position you’re gonna be, but the longer it compounds negatively, the worst position. Get some good advice, and keep reading, keep educating yourself. It might sound like Greek now, but as you keep educating yourself, you will find, like learning any language, over time, it becomes more understandable, and you can at least understand what people talk about if you can’t action it, but over time, once you get to that understanding phase, you will soon move into the phase where you can manage your money by yourself in a great way. Thanks so much for listening. I’m Lisa Linfield, and this is Working Women’s Wealth, and I would really ask that you put ratings in for the show, or you write a review because Itunes is very favorable to shows that have positive reviews and higher ratings. The reason that that helps the show is that it puts it for free in the free advertising. Please do like our show. Please do rate it, and please do write a review, and for some crazy reason, the reviews in Apple Itunes, you need to write your name with letters and numbers and make it as weird as possible, and then they seem to think that that’s proper review rather than a fake robot. Have a great day. Keep investing, and I really hope that this year’s gonna be a great year for meeting your financial goals. Take care. Bye.